Bullying is not only a youth issue; it’s a workplace problem. And when it happens in social services, client care can be compromised. Adults often view bullying primarily as a youth-oriented problem, but the same behavior can persist into adulthood and manifest in adult activities. Bullying can occur in any workplace, even social services, and is similar to the intimidating and disruptive behavior among children and teens. It may undermine safety in the workplace and negatively affect relationships with clients or, even worse, put them at risk. Though it’s an area where social workers can play a critical role in facilitating solutions, it’s important to recognize that social services are not exempt from the dynamics and adverse effects of bullying. In fact, according to the Workplace Bullying Institute, as many as one-third of workers may be victims of workplace bullying. And in approximately 20% of the cases, bullying does cross the line into harassment. Frederic G. Reamer, PhD, a prominent ethicist and professor of social work at Rhode Island College, says bullying can manifest in several different ways. While most people think of vertical bullying occurring from the top down (as in the boss bullying his or her workers), Reamer says horizontal bullying (workers bullying each other) can be just as frequent. In terms of what causes the bullying, he says social workers are particularly well trained to identify those causes and seek out solutions. Long hours, large caseloads, and the emotional toll of the job are just a few reasons why social workers often are already under tremendous stress. Add bullying to the mix and there’s no doubt that it can lead to negative health consequences. Those consequences may affect the social worker’s ability to work effectively with clients, Hoffman adds. “A social worker who is struggling with his or her own professional identity, confidence, or sense of community may be more vulnerable to depression and anxiety disorders which can impact care,” she says. Social workers’ understanding of issues such as domestic violence or workplace impairment and training prepares them to recognize and address workplace bullying. The stress that results from workplace bullying also can result in numerous health-related symptoms that social workers often are well equipped to understand. On an individual level, social workers can offer support and counseling, using their crisis intervention skills to work with these victimized individuals, Reamer says. 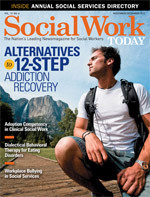 “A good social worker understands how to meaningfully help someone who is depressed, feeling anxiety, or even manifesting symptoms of posttraumatic stress disorder—all of which can be a result of workplace bullying,” he says.